The Barcelona Padded Halter Top is a hot and stylish update to our much-loved Azure Padded Top; featuring the same design details, but in a gorgeous soft lurex fabric that oozes luxury and glamour. It has lightly moulded cups, offering nice shape and subtle support. Finished with beautiful halter ties and a snap back clasp. 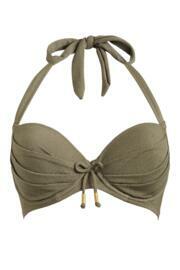 Bikini top is described as padded - there is no padding in this top at all!! Product description is very misleading. Lovely bikini but if you are looking for something that is padded, this is not the one for you. Contemplating returning it. Good fit, good quality, speedy delivery ?? Poor description. Described as padded but didn't give any boost or enhance a small bust. Would be ok for larger ladies. Great quality. I would always order a size bigger though. Both times I have ordered I've had to send back and get a bigger size! Worth it though! Good quality and fab style! Brilliant! Great fit and beautiful quality. Great shape, wife loved this. Elegant and glamorous! Everybody asked where i got it from! I washed this on a delicate cycle after one wear and the ends to all of the underwire seams have frayed to such an extent that the top is unwearable (frayed bits sticking out from my cleavage and armpit areas is NOT a good look!). Customer services tell me the bikini is 'hand-wash only' but I would say that after just one wash in a delicate cycle this sort of thing really shouldn't happen. Unless you really want to wash this bikini by hand (whilst wearing kid gloves!) AVOID! Good fit. Im a 32D and it fitted well with good support. True to size and even nicer when it came x absolutely love it x ? ?